With fall just around the corner, we want to keep our yard growing healthy. Now is the time of year when everything on your landscape will need the essential micro and macro-nutrients to help them thrive all year long in our native soils. It doesn't matter what types of plants or trees you have on your landscape as palm trees, desert trees, tropical plants, fruit and citrus, shrubs, and evergreen trees all need these nutrients to grow healthy and strong. With so many fertilizers on the market, it can be overwhelming trying to find the correct one for your landscape. Fortunately, the nursery pros at Moon Valley Nurseries have eliminated the headaches and guessing game for you by developing highly specialized blends of fertilizer designed to trigger growth responses for our native soils. Our pros have been growing and planting trees and shrubs in our region for more than 40 years. These fertilizers have been time and tested, and our pros use all of these fertilizers on our thousand acre grow yards all year long. 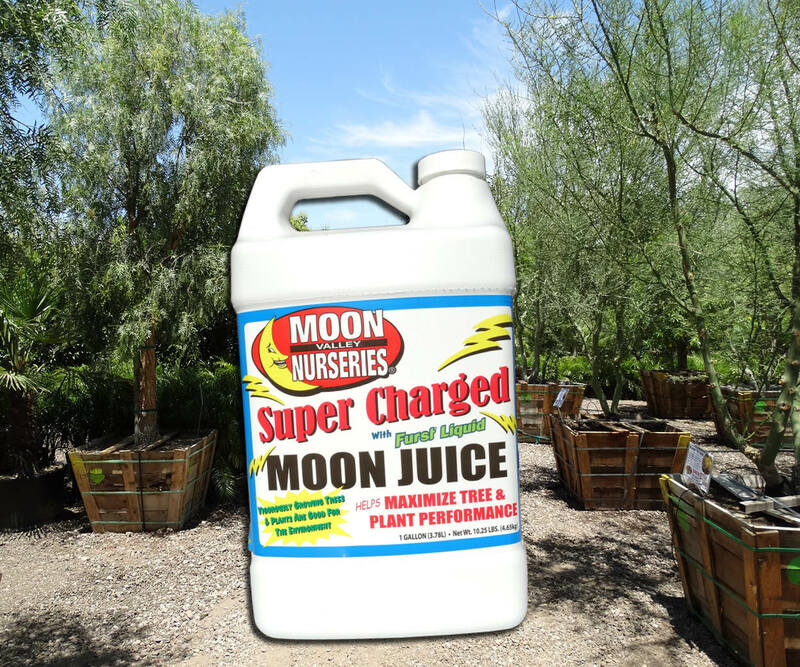 Our Supercharged Moon Juice was designed specifically for growing in the tough soils in our region. Every bottle of Moon Juice contains Furst Liquid technologies which include a proprietary blend of organic enzymes and amino acids to stimulate the growth signals within the plant. It increases nutrient uptake, promotes new growth, helps improve fertilizer efficiency, and it enhances the ability to ward off disease. Supercharged Moon Juice also contains the three most essential micro-nutrients required by nearly every tree and plant. Iron, Manganese, and Zinc is a part of Moon Juice because they are typically deficient in most warm weather soils. Also, thiamine mononitrate (Vitamin B-1) is included for its beneficial effects on new plantings. Purchase here. 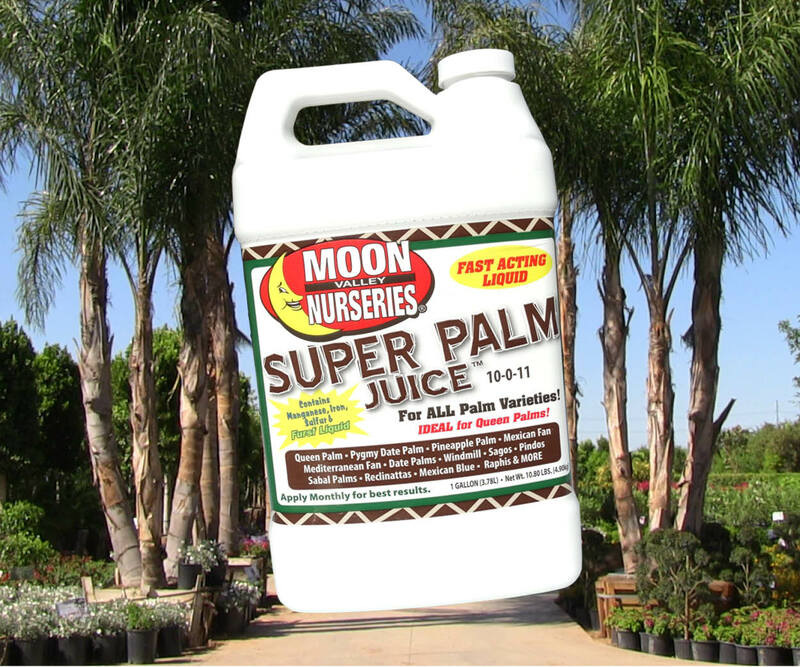 Our Super Palm Juice was created to fertilizer every palm in your landscape. Palms have special nutrient requirements, and the formula in our Super Palm Juice provides them with a variety of different major and micro-nutrients including potash, manganese, iron, sulfur, zinc, copper, and boron. This combination of nutrients provides well-balanced nourishment as they grow and mature. Also included in our Super Palm Juice is Furst Liquid technology, which triggers a natural response in the palm to allow it to take in more available nutrients in the soil. This reaction increases fertilizer efficiency, palm health, yield potential, and the overall quality of the palm. When used as directed, Super Palm Juice helps produce thicker, stronger trunks, while maintaining the fronds with a healthy, dark green appearance that results in lush, dense crowns. Purchase here. 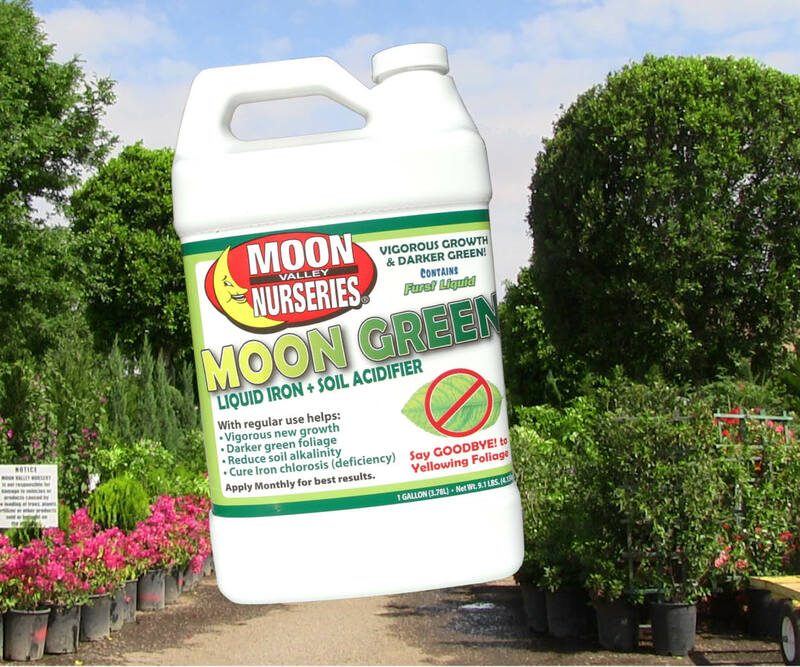 Our Moon Green was created as a super easy and safe solution for yellowing trees and plants. Iron Chlorosis is a problem for many homeowners in our region, and Moon Green helps reduce soil alkalinity, neutralize caliche/tight clay type soils, and promotes darker and greener leaves and grass. Infusing Moon Green with Furst liquid brings the critical organic enzymes and amino acids that help stimulate the growth signals within plants. These nutrients help stimulate root hair growth and stronger cell development, allowing water and essential micronutrients to pass through to stems and leaves much more efficiently. Purchase here. 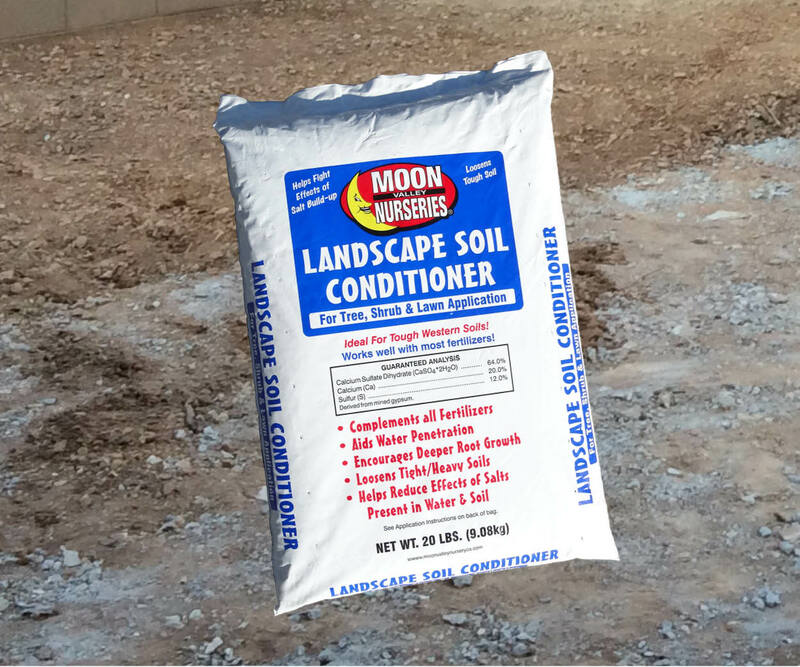 Our Moon Dust Fertilizer is an organic blend developed especially for tough, compact alkaline soils. Moon Dust provides vital nutrients like Nitrogen, Phosphorus, and Potassium. These are essential elements in a perfect horticultural ratio that will benefit all of the trees and plants in your landscape. 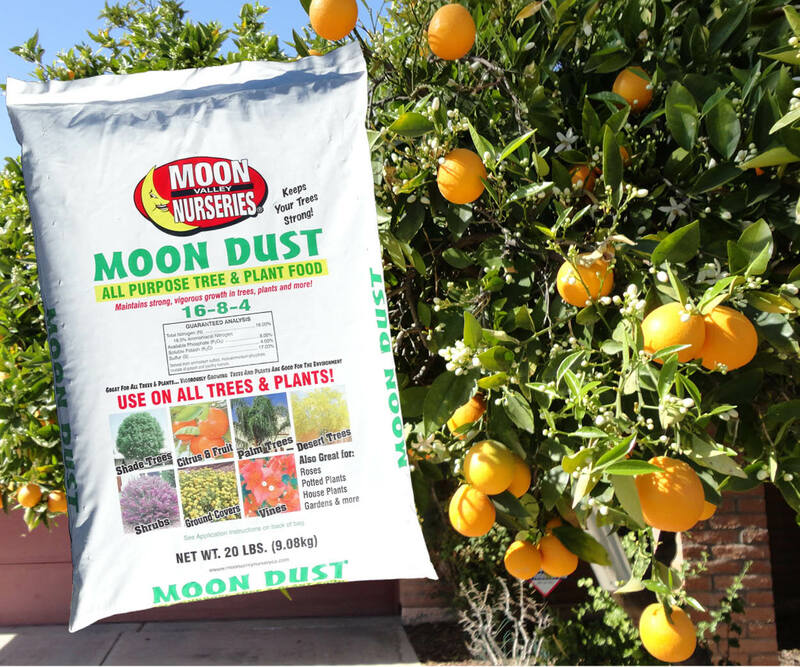 Moon Dust helps trees and plants grow faster, stronger and flourish with less water, Citrus and fruit trees produce larger and tastier crops, Flowering shrubs have longer and more abundant bloom cycles and makes bedding plants and groundcovers more vibrant. Purchase here. One of the most challenging aspects of growing trees and plants in Arizona is the hard, compact soil and high Ph found in our soil and water. This alkaline condition prevents major and minor nutrients from converting into compounds that are available to living plant roots, and the compact soil prevents proper drainage of water. To counteract the problematic soil in our region, Moon Valley Nurseries has developed a Soil and Water Conditioner that contains two special elements: Sulfur reduces the high Ph by flushing out the excess salt buildup in the root system. The removal of the excess salt creates a soil base that converts nutrients easily. Gypsum is the other special element, and it will loosen soil leading to better drainage and healthier soils. Several applications per year will make a noticeable difference. Purchase here. Remember to fertilize all your trees and plants monthly from now all the way through the fall. We know your landscape is an important investment for your home and family, and that’s why we’re always here to help – feel free to visit or call our nursery with any of your questions. Neglected trees are the most common cause of death, and healthy trees will withstand the elements much better. Taking just a few moments once a month to feed your trees is the easiest way to protect your investment…you wouldn’t let your pet starve, so why let your trees and plants? Click here to map a nursery location near you.